This was going to be my last round for a few weeks as I think my feet have earned a rest and I need to get organised for the East Highland Way with a possible Speyside Way extension. I pretty much spent the early part of the week looking a different routes when I came across The White Mounth circuit, 5 Munro's over 18 miles, doddle. Aye right. I tried to arrange a meet and see if anyone fancied it, I did have one taker but due to time constraints as I have/had plans for Sunday (I'll expand on this later), it didn't work out. The pull up to Lochnagar wasn't too bad and I kept telling myself, that's the worst of the day over with. About 45mins later I'm sat next to the Trig Point taking everything in again, stunning. I decided I was going to go and look at some aircraft wrecks. I'd noted the coordinates last night and slipped the paper inside my map, slight problem, no paper. Annoyed with myself I set off towards Carn a'Choire Bhoidheach. 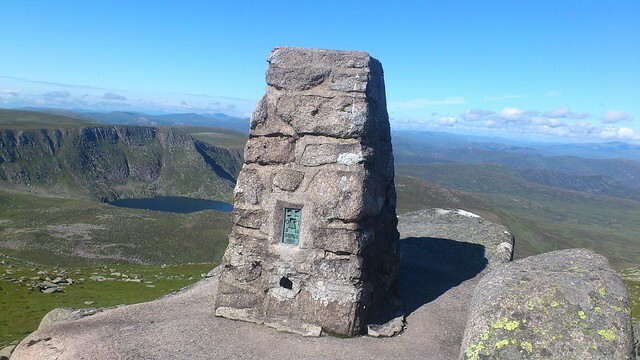 This was quite an easy wee jaunt over and very soon I was sat having a ciggie at the summit thanks to the shallow bealach and very little height lost. The walk over to Carn an t-Sagairt Mor was not as easy, I didn't realise the drop in height but to be honest I was at the crossroads very quickly where I bumped into a guy who has taken 3 months off work to some hiking and hillwalking, I just thought he was a jammy sod as I struggle to get 3 days off. 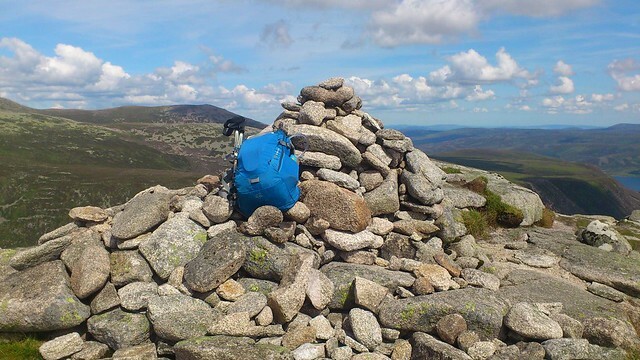 We said "cheerio" and went our separate ways I headed up and low and behold, two cairns (I couldn't remember which one the WH route said was the summit) I touched both to be sure only to find that when I turned round the more southern one does sit slightly higher. I met a group of 4 ladies out for a wee jaunt bagging 2 up there who were only to happy (as was I) to sit and have a wee natter. Next up is Cairn Bannoch again this was a pretty simple pull up to the summit with some great views down the Glen. 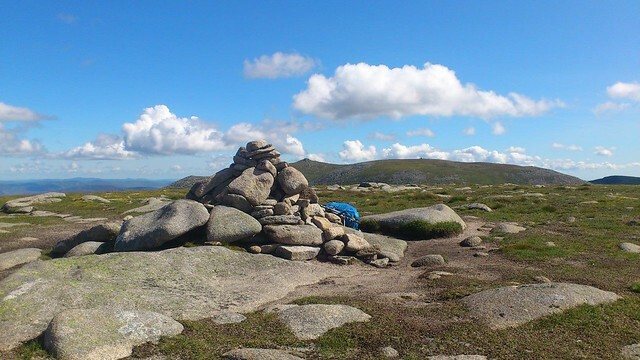 Only briefly spoke to a fell runner before I was on my way again towards Broad Cairn. This summit truly is a great vantage point for having a good look, well everywhere. I sat and had a good rest before starting what turned out to be a long and torturous descent, 1st up is the boulder field and no nice easy going path, just pick your way down and hope that the boulder you're about to step on, doesn't move. Finally made it to where the path splits, Glen Doll, high level path or stalkers path, I opted for the latter as it looked in better shape, that didn't last long, it became very loose and rough the further I descended and my feet were having a right good moan and I mean a right good moan, eventually made down to the loch and over to join up with the higher level path. I pretty much limped the last 3-4 miles before finally arriving at the car, this is where I think I found the problem, the talc I put in my socks to help keep my feet dry(ish) had compacted and settled under my toes, no bloody wonder it hurt. Haha I started the 4 from Drumochter around 20 mins before you, then three weeks later you start the the White Mounth Munros a couple of hours before me! I'll agree what a stunning day. I also took in the Corbett which was a really worthwhile quick detour to get nice views over to the corrie. 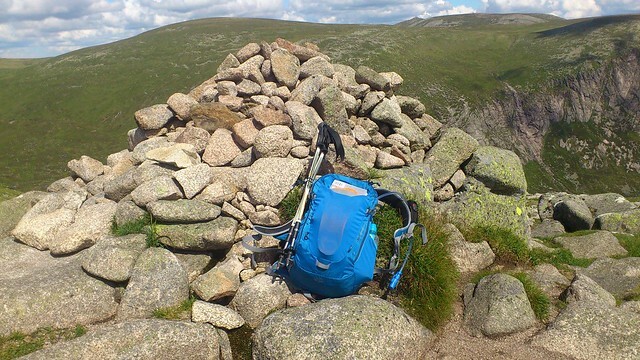 As for the plane wreckage, I completely forgot about this, but I bumped into a couple on Munro no3 who ascending a different way and pointed out to me their was a wing about 20 yards off the summit. Oh well it'll never be a chore having to go back up Lochnagar! 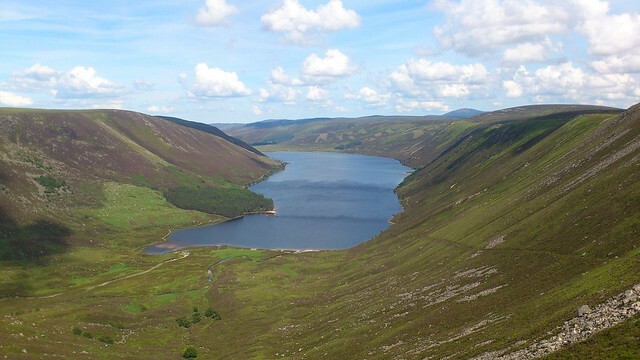 gmr82 wrote: Haha I started the 4 from Drumochter around 20 mins before you, then three weeks later you start the the White Mounth Munros a couple of hours before me! I'll agree what a stunning day. I also took in the Corbett which was a really worthwhile quick detour to get nice views over to the corrie. How'd you find the round? Backpacker wrote: How'd you find the round? Thanks, I really enjoyed it despite the ending.